The bracket sits approximately 6" off the floor and 6"-7" away from the facing of the bar. With two contact points, this double-footed bar rail bracket combines a sturdy build and a classy design. For proper support, bar brackets should be placed at each end of the tubing, plus one for every 4-foot increment. Wall to Center of Tubing: 6.125"
Floor to Center of Tubing: 6"
Floor to Bottom of Mounting Plate: 5.5"
Attractive style but workmanship and hardware are not up to expectations. With the attractive design I would recommend this product but with caution. The end caps were machined too small to properly fit on the inside of the tubing. I had to use tape wrapped around the cap diameter to make a tight fit so the caps would not fall off the tubing. Also, normal installation would dictate use of a power driving drill to install the decorative polished lag screws provided. They are made of a soft material and very prone to stripping. I had one become completely unusable. Happy the way my brushed stainless steel foot rail came out. The only problem is installing the set screw in these brackets. They come with a self tapping set screw that you are supposed to drill through the stainless tubing. Good luck!! We couldn't even get a drill to go through that tubing. We ended up just cutting the set screw very short and then just tightening it up against the tubing so it won't slide in the bracket. Installation not as simple as they make it seem. But it did turn out beautifully. I think maybe the other finishes like brass may be easier to drill through, but the stainless is very difficult. Very attractive and sturdy. Overall design is excellent however the holes didn't seem parallel all the time. Just a small thing and not very noticeable. Something else though is to make sure the tubing hole is completely free of burrs. I did see some burrs and they totally scratched my rail. Really nice looking and sturdy bracket. I ordered the Foot Rail Brackets for my outdoor kitchen and was not disappointed ! 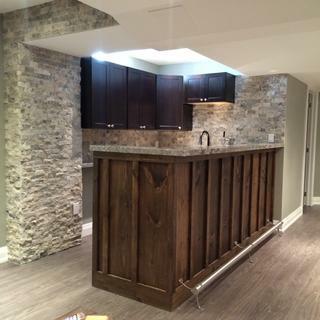 The shipment was fast, the material was great quality and they fit perfect to my new kitchen. Worked perfect for my outdoor kitchen! Fit my 2 in. Foot rail perfect. Like the look, install was straight forward, and price OK (not great). Milled beautifully. Very stylish. Sturdy Guage material. They were easy to install look great. We have had nothing but great compliments on there looks. 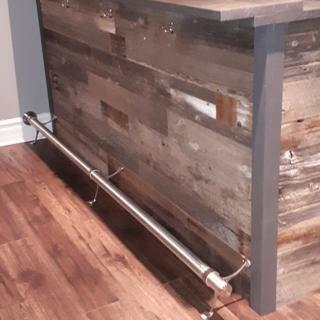 This rail was the finishing touch to our bar. Very good quality. High quality stainless steel. I ordered three brackets. They are all the same size and angles. I did not have any problems with the anchor screws because I read the other reviews and started the anchor screws before installing the brackets and tightened by hand after putting the rail in. My home bar looks official after installing these classy, modern brackets. Purchased these brackets because I like the style. They really look great on my new bar. Very pleased with my purchase and the service I received when I placed my order. Thanks Darien! Ordered a footrall for our in home bar. It came with 3 of these mounting brackets. 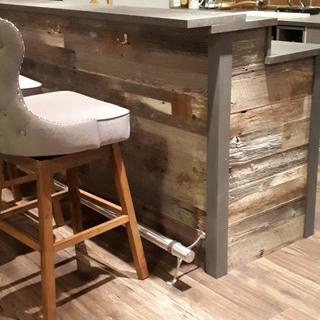 We wanted our 3 stools to be evenly spaced along length of bar while pushed under overhang. Sturdy enough without 4th bracket, just a personal choice. Looks great, expedient service, quality material. Would order from KegWorks without hesitation. The brushed stainless steel is very nice and looks terrific . I don’t understand why there is not a threaded set screw( instead of a self-tapping) . It’s very difficult to install it ( you have to drill a hole first and have a right angle drill to clear the bracket . Also , why don’t the end caps have an internal spring loaded button to grab onto the inside of the tube - instead of wrapping it with Teflon tape? Thank you for your feedback. Your brackets should have come with wood screws for mounting to the face of the bar and set screws to stabilize the rail within the bracket. If those were not included, please contact our customer care team and we'll be happy to send the proper screws. Glad to hear you were otherwise happy with the brackets. Thank you for being a KegWorks customer. Cheers! This good experience started with great advice in the chat function, easy ordering, and prompt arrival in good condition. Our product was installed by a handyman. The design is a little difficult with 4 angles of 135 degrees. He didn't have any difficulty and it looks great. I can't rate durability because of newness. I need one more. I like the look of this. It looks like it fits our bar rail. LOL This is the one my husband liked best! I have made three orders with KW. On the 2d they checked the order and contacted me about some items seeming to not match one another. They called within an hour (who does that on internet sales?) and all was fixed. Got the order the next day. Excellent service, and great products. All hardware in the room is brushed stainless or brushed chrome. 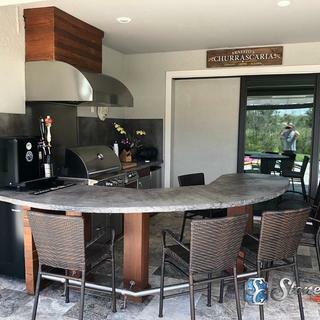 Having just finished remodeling and refurnishing our kitchen and eating area, we realized that the beautiful kitchen island and barstools would both get torn up if we didn't put a foot rail down to protect them. Having searched for options, the KegWorks brushed stainless foot rail will the perfect way to solve this problem while also adding design interest. The combination foot rail bracket has personality and is what we need functionally. Specified by Architect for construction project. For more support for the railing. I have bigggg friends and they drink a lot. I do not have access to the backside of my bar or I would have used the "hanging" mount. So I went with this mount that uses the floor for support. Matches bar design, all parts listed as in-stock and available. We wanted to have the support at the island but also from the floor. This gives the needed support should someone stand on top of bar rail. Probably steadier with floor and wall mount. Nice and sturdy design. Flows with the other brushed aluminum foot rail pieces. REASONABLY PRICED. STURDY AND ATTRACTIVE. 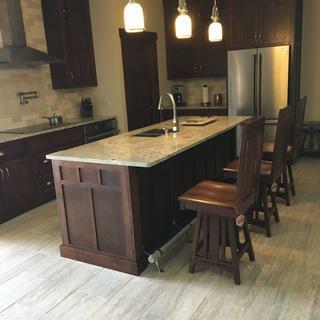 We have an island with stools and wanted to protect cabinets from them as well as having a foot rest. what is the proper spacing for the rail brackets ? BEST ANSWER: Hi Ted! Thank you for your question! You’ll want to make sure your foot rail has the right amount of support, so you’ll need a bracket 6 inches from the end of your tubing or elbow and an additional bracket for every 3 feet of tubing to ensure that your foot rail is nice and sturdy. For example, if you have 8 feet of tubing, you’ll need 1 bracket on each end and 1 in the center, for a total of 3 brackets. Read our Adding and Installing Bar Rails page for more info! do a mock up w/o attaching brackets permanently, and adjust to your likings and aesthetics. My husband put them four inches in from each end. What's the best way to screw the mounting bracket screws? I have stripped 3 now. BEST ANSWER: Brian M. What kindve material are you screwing into? We installed these on a commercial project but had a wood substrate to drill into. As with any finish screw I would recommend a very small 1/16" pilot hole be drilled this will allow them to go in smoother and not burr up the threads providing a cleaner look. Hope this helps. Use a cordless drill with a phillips bit. Go slow and steady with pressure on the drill.You do not need a ton of support at the screws because the floor pad will support all the weight. I had same problem. I had to drill the holes not too small and not too big, then put soap on the screws to lube them so they would turn and not get too difficult to set. Don't use the screws that are provided with the bracket, I had the same issue and had 16 Brackets to install so I used silver medium size wood screws with flat face. I also stripped my first screw because the metal is soft. I drilled a pilot hole into my oak bar and used a power drill to put the screws in. I had the same problem. Pilot drill a hole but utilize stainless steel screws, not the screws provided as they are too soft of a material. I mounted mine into hemlock beams which were very hard. I pre-drilled my holes to make the installation easier. Have u pre-drilled the holes where they are being mounted to? Yep. Not sure if it's the quality of the screw or what. I will check a local hardware store for another option. Does the 2" foot rail fit into the 2" combination bracket? It sure does and it looks great. We installed without set screws and the foot rail keeps sliding out, what size set screws do you recommend? BEST ANSWER: Hi. I will ask my contractor that performed my installation. They anchored mine quite well and we have no sliding or movement. I used a #6 stainless steel, panhead self tapping screw, 5/8" long because that's what I had, 1/2" would work. What thickness of wall are the hollow wall anchors in the package designed for? BEST ANSWER: Mine was attached to the base of my bar. As I recall it is at least 1/2 thick but it is a baseboard attached to the bar so the thickness is an additional 1/2 I suspect. It is in our beach house and I am doing this off memory. I don't remember how long they were but it was drilled into 3/4" walnut. The bracket was mount to wood. Do you make a higher bracket than 7.1 in. high? My bar stools are higher and your feet won't reach the bar. BEST ANSWER: If you would like to mount your foot rail higher than the Combination or Floor Mount brackets allow, you can opt for a Bar Mount Bracket instead. A Bar Mount Bracket secures to the face of the bar from the rear with a nut and bolt assembly, so you must have access to the back of the bar for installation. My bracket is 7.1 in. The seat on my stools are 27 in high. I am 5ft 2 inched tall and my feet reach the bar when sitting. Hope this helps. What is the dimension of the distance from the bar to the rail? ie. how far does the rail stick out from the bar face, my friends have big feet! BEST ANSWER: The rail extends 7.25" from the face of the bar. Should be plenty of room for your giant friends! Does floor support get screwed to floor or just rest on floor? BEST ANSWER: Hi Frank, this support just rests on the floor.